Original painting by Sebastian Krüger. Acrylic on board measuring 45 X 35 cm. (18 X 14 inches). This painting is of a fictitious character (and therefore is considered a cartoon). Krüger cartoons have gained enormous popularity, even rivaling some of Krüger's greatest and most coveted iconic portrait paintings! 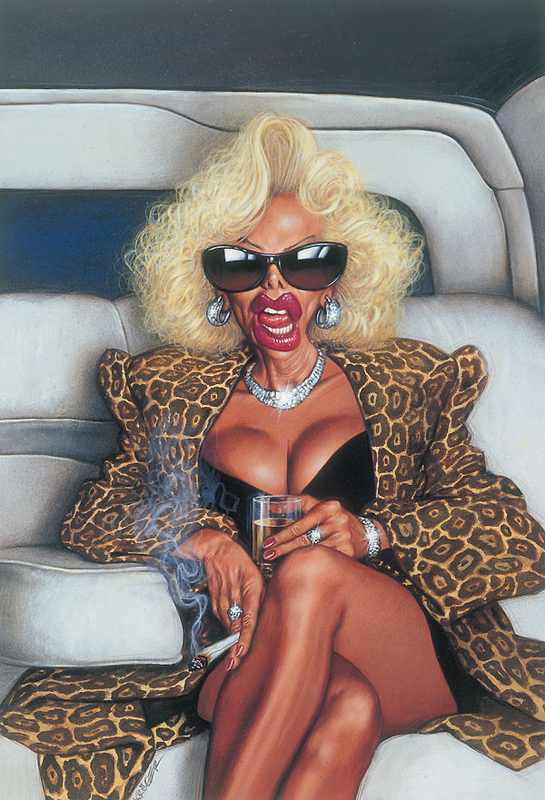 This painting in particular is extremely rare in that it includes sunglasses, a glass of whiskey, and a lit cigarette. Each item separately being depicted in fewer than 10 works each out of 1000. And this painting is the only one with all three items; with each item rendered beautifully! Surprisingly, only about 1 in 20 earlier works (1987 - 2004) were of women, and just a small fraction of those show teeth or a tongue. In fact, this woman subject is 1 of only 3 known Krüger women with an open mouth, showing both teeth and a prominent tongue; further increasing the rarity of this piece. This would be the perfect power painting for the office of a successful female (or even male) executive, as it's oozing with confidence, success and jet setting accomplishment!